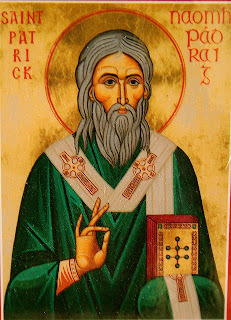 The legend of Saint Patrick driving the snakes out of Ireland may be nothing more than misreading of an ancient text. According to Irish lore, Saint Patrick scattered the serpents and drove them into the sea, though most naturalists are convinced that larger reptiles were never part of our fauna. Now it's emerged that the myth may have come about because of a too-literal translation of an ancient sixth century text called the Dinnshenchas. The text carries an account of a sect called the Crom Cruich, who used the symbolism of the snake. In time, Crom Cruich eventually became a powerful force in Ireland, whose followers used the snake as their symbol. And herein may lie the real story about Saint Patrick driving out the snakes. "Crom Cruich which literally means bloody crescent, was a pagan site of worship near the village of Ballymagauran in County Cavan. It's exact location was in the plain of Mag Sleact, which translates into the field of adoration. At its entrance was a large megalithic standing stone which was surrounded by 12 smaller upright lintels. So in a sense it looked like Stonehenge in England." "The Crom Cruich cult were very bloodthirsty with the faithful expected to sacrifice their first born in his honour to assure a successful harvest. The annual slaughter took place on the pagan feast of Samhain, on November 1, each year," explains historian, Thomais Moriarty, who specialises in pre-Christian Ireland. It's recounted in the text that Saint Patrick marched on the place with a band of well-armed missionaries, mocked its demons, blessed the place afterwards and then destroyed the site. "By all accounts, a major battle took place, but Patrick and his well-armed followers won the day. "The people feared terrible retribution from the pagan god afterwards, but it never came to pass, and from that point onwards, the cult's grip was effectively broken in Ireland for all time. The event is recorded in the 6th century Dinnshenchas text, otherwise known as the Book of Leinster," adds Thomais Moriarty. According to Brendan Scott of Cavan County Museum, a standing stone which stood at the entrance to the site was destroyed but the Crom Cruich idol is still in existence: "We have the Kilcluggin Stone which is part of the original Crum Cruich idol. When Saint Patrick came along it was covered in gold and would have stood in the centre. Surrounding it were 12 smaller stones which were covered in silver. There is a rath (fort) at the top of a hill near Ballyconnell in west Cavan called Derryrath, and I reckon that was the original site where Saint Patrick had the battle and destroyed the idols. Is the Bible a Lascivious Book?